Wait is not long for the fans of Transformers: Robots In Disguise. Thanks to a Press Release we’ve received from Cartoon Network (Germany), Season 3 of RID is to air January next year. A specific date is not announced yet but the season is to air 6:40AM on Saturdays and Sundays. We expect the global rollout of the season to happen around the same time frame. Als der cybertronische Gefangenentransporter Alchemor auf der Erde abstürzt, werden gefährliche Decepticons auf freien Fuß gesetzt. Bumblebee soll nach Anweisung vom Optimus Prime ein kleines Team zusammenstellen, um diese erneute Gefahr durch die Decepticons auf der Erde aufzuhalten. Doch die Menschen dürfen keinerlei Verdacht schöpfen. Season 3 does not appear to be screening in Germany. I\'m hoping for Windblade, Ratchet, Undertone (Ratchet\'s Mini-Con), and Jazz to return. I\'m also hoping for Arcee, Bulkhead, Wheeljack, Smokescreen, and Ultra Magnus from Transformers: Prime will return. Sorry, I´m abit late but where did you find that info? I tried looking it up on fernsehserien.de and the newest episode is "Worthy". Season 3 has aired Starscream comes to earth looking for Mini-Cons. That was Season 3. Incorrect. As the previous post person stated, the "mini" season with Starscream and crew coming to earth to look for the mini-cons was officially 2.5. Not sure why they decided to split up season two that way, but that's what they're calling it. 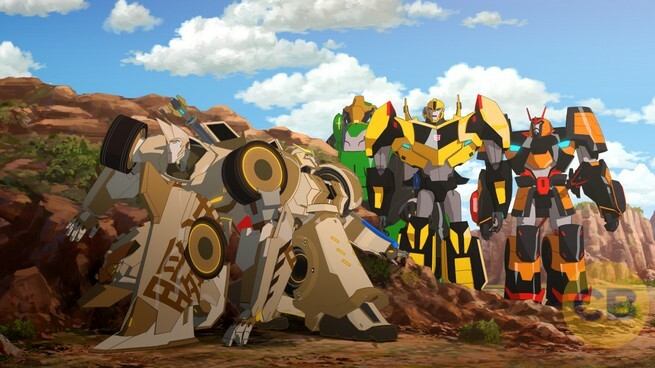 Alchemor crashed, Decepticons loose on earth, Bumblebee assembles a team to apprehend them. Thats all. could someone please tell me what\'s those German mean? Shame this probably won't have the English audio. I doubt Teletoon will be airing any new episodes soon, they're still in Season 2 reruns. Someone has stream CN de? jokes aside does cable have a second language option on Germany? because if there is, it can be recordes in english, like a Brazilian guy recorded the Everfree MLP movie when it aired here. if CN US frags up again with the airings we could maybe have this. who knows. I mean, if anything we will at least be able to tell whats going on and who shows up. There are plenty of German fans who I'm sure won't mind giving us a good rundown. What? You know I don't speak German. I hope there's a payoff with this "new regime " on Cybertron that's been mentioned and the sudden turn from Optimus being a war hero with statues shown at the beginning of the series to being exiled after his return from the grave. US normally have it one episode per week while Uk starts 3 months later at 2 episodes at the weekend & gets to the end 1 month before the US do. Hopefully the first and second halves of season two make it to DVD soon. As a full season, not as two parts. That was season 2.5, but I guess you could call season 3 if you want. I still haven't seen season 2 or 2.5. anyone know when they will hit Netflix? Really hoping some of the new toys like Stormshot, Twinferno, Bludgeon and Blurr appear. Actually quite excited. Anyways, I'm pretty excited for the new season. I can't wait to see the new Decepticon combiner.